An “ordinary” couple poses for their portrait at the Sterling, Nebraska photographic studio of E. T. Benson (1870-1935). 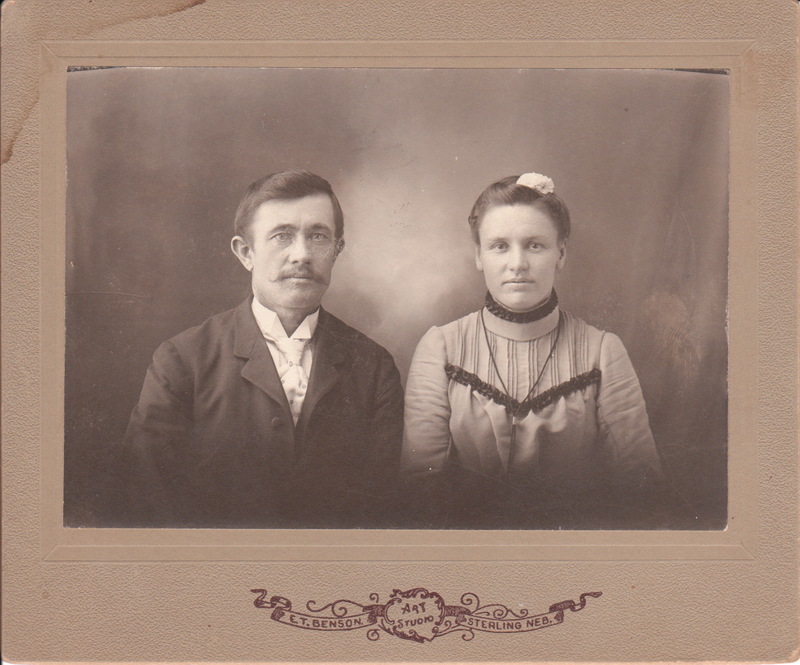 The couple are identified on the reverse of the photograph as Albert and Bertha (Wuske) Maulis. Research uncovered a copy of this image and it was referred to as a wedding picture. Albert Moulis (1868-1960) is listed in the 1900 through 1930 US census. The 1900 US census reveals that he was born in Bohemia and immigrated to the US (1888). His occupation was listed as farmer. He is also listed as a farmer on the 1910 census but by 1920 he had become a machinist. A popular genealogy site has an entry that states that Albert’s journey to America started when he stowed away on a ship rather than enter military service in the army of the Austrian Empire. Albert’s wife, Bertha (1878-1937). , was Nebraska born, but came from parents with Prussian and German heritage. This vintage photograph is in good condition (see scans)..